Petunia just moved up to the next level class in swimming. I think this tired her out, and she went to sleep easily today. Or maybe it was just a random thing. Either way, she's asleep earlier than usual, and I just sat down to do something on my to do list. I have some financial papers I need to review and sign, and a contract with an editor that I need to write... and blech. I don't want to do any of that. I am feeling out of sorts tonight, for no reason I can pin down. So instead of trying to power through something on my list, I'm going to write a blog post. And I'm not even going to finish the somewhat ranty post I have started on the things that actually make me feel frustrated with my life (i.e., the rant I hinted at in my review of I Know How She Does It). I'm in the mood for something fun. Like reliving the 10 days I recently spent in France with my husband... and without my kids. The backstory, for anyone who missed it, is that one of my very best friends was getting married in Dax, and there was no way I was going to miss the wedding. Since I was going to be in France anyway, I wanted to make a vacation out of it. However, it was during the school year and it would have been really expensive to take the kids. My parents offered to watch them, so Mr. Snarky and I got a little grown ups-only vacation in France. We've done weekends away before, but have never strayed out of Southern California together without the kids. So this was a new experience. We had a great time. (Big surprise, I know.) 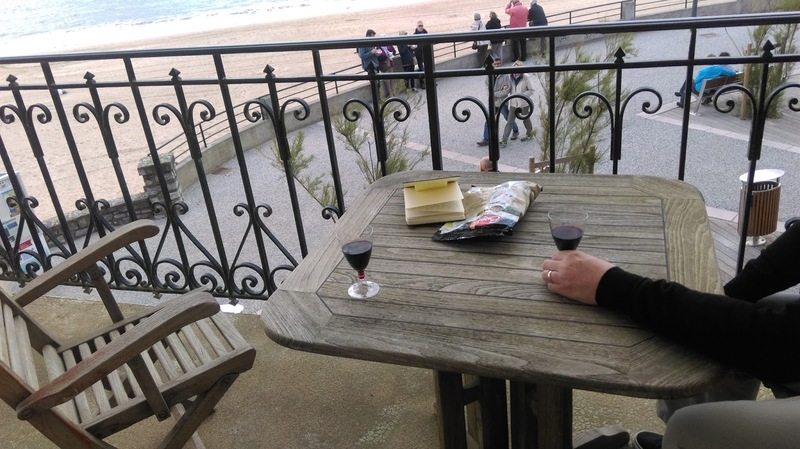 We visited Bordeaux, St. Jean de Luz (in the Pays Basque), and Dax, with some stops along the way. We also drove over to a little town near the riviera to see my sister-in-law and her family, which was a big detour, but worth it for the chance to meet our almost two year old nephew in person for the first time. Best hotel: La Maison du Lierre, in Bordeaux. This was such a charming boutique hotel, completely French in style and sensibility, completely welcoming in approach to hospitality. It was a wonderful way to start the trip. We had a comfortable room, and also enjoyed the beautifully decorated and comfortable common areas, which included an outdoor garden/deck where we enjoyed a bottle of wine one afternoon. The other hotels we stayed in were good, but this one was the best. Best food experience: The unbelievably good tomato soup I had one night in St. Jean de Luz. I wish I knew what made it so good, but I don't even have the words to describe just how good it was. All I can say is that it was a revelation, and that I had a stereotypical "jaw drop" moment when I first tasted it. I suspect Mr. Snarky would say it was trying pinxtos (tapas) at the bar we visited before going to the restaurant where I had my revelatory tomato soup, but this is my blog, so I'm sticking with the soup. Biggest food mistake: This one is a tie between the plate of mushrooms I accidentally ordered for lunch one day (I'm not a big mushroom fan) and the fact that we kept eating "big" meals and it was just a little too much for me. I had wanted to indulge in more ice creams, pastries, and chocolate than I ended up having, but instead my rich food quotient kept getting spent on heavy meals. We eventually learned to opt for a simple ham and emmantal baguette for lunch more often, and that helped. Favorite sightseeing experience: Seeing cave art from 35,000 years ago at Les Grottes Isturitz et Oxocelhaya. These are not the most famous caves with prehistoric art in France, but they were convenient to our planned route from St. Jean de Luz to Dax, and it was definitely very, very cool to look at a horse carved into stone tens of thousands of years ago. Worst sightseeing experience: Oversleeping on our last morning in Bordeaux, so that we missed breakfast and were already running late when we got to the train station to pick up our car. And then missing our exit on the ring road, making us even later for our planned visit to St. Emilion. In the end, we decided to give up on seeing St. Emilion, and had a surprisingly good ham and emmantal baguette at a gas station alongside the freeway. Then we regrouped, and headed south and enjoyed a somewhat leisurely drive to St. Jean de Luz. Most relaxing stop: St. Jean de Luz. Bordeaux is not a huge city, and we found it to be very easy to get around and accessible for the tourist with only so-so French. Still, it was a city, and while I enjoyed our time there, I didn't really relax. 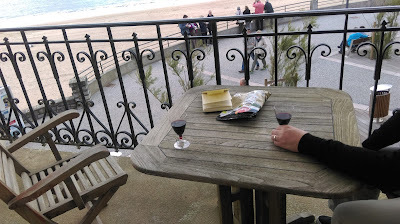 In St. Jean de Luz, though, I relaxed. It is a beautiful little town, with enough to do in town and nearby that we weren't bored, but not so much to do that it felt wrong just to sit and relax a bit. I can imagine it would have been even more relaxing if the weather had been nicer for us- it was cold and a bit windy for the first part of our stay, and we never really got to enjoy the private ocean front balcony I paid an extra 10 euro per night for. Oh well. cold to enjoy a glass of wine on our balcony. Best random thing: The remains of a Roman colosseum in Bordeaux. Our guide book didn't make a big deal out of it, so it was sort of cool to just stumble across it while walking around! What? This old thing? It's just the remains of a Roman colosseum. No biggie. Worst/Best parenting moment: When I corrupted some other wedding guest's tween daughter by telling her that one of the best things to do in a foreign country is to go into a grocery store and buy some junk food. You get to feel like you're experiencing something different... and still eat junk food! Her mom actually looked rather glad for the idea, though. I guess the girl (who was delightful) was having a hard time getting into French food. And she hadn't even accidentally ordered a plate of mushrooms for a meal yet. All in all, it was a great trip. I'll write up full trip story posts soon!